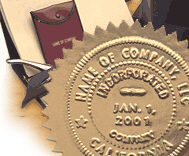 File Articles of Incorporation documents with the state agency in the most expeditious manner. Prepare and transmit/deliver documents to the Division of Corporations. Monitor progress of documents to prevent (avoidable) delays. Maintain a close working relationship with government agencies to help cut through "red tape." Return proof of filing in the form of a certified copy or a stamped acknowledgment copy. *15% service fee will be added to disbursements advanced for required fees paid on client's behalf.